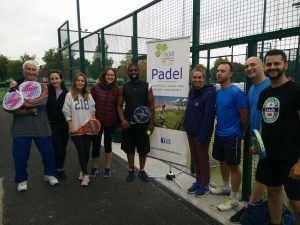 In order to participate in Official Competitions, players are required to hold the corresponding valid federation licence issued by the Padel Federation of Ireland. What are the Benefits of Affiliation personally and at club level? -Managing relationships with the Irish Sports Council (Sports Ireland), the Minister for Transport, Tourism and Sport and a host of regulatory and voluntary agencies within the Irish sports community. -Managing a variety of communications programmes with the national padel community, including the sports media and our various web and print publications. -Administration of the National Anti-Doping Programme for padel. -A tournament sanction and calendar service. -We select and manage the National Team and organise tournaments internationally. -We also operate and manage a Padel Academy sponsored by Adidas. The Academy caters for players of all ages and ability. -Possibility of taking part in official tournaments both at local and national level. -Possibility of taking part in the most important team events and represent the province. -Official national ranking service, updated after all Federation tournaments. -Discounts on padel merchandise sales at selected shops, padel lessons and clinics. -Adidas (official sponsor) online shop discounts and advertising benefits for clubs. -The Padel Federation provides coaches training programmes which are certified by the European, Spanish and International federations. We train the coaches who work at your club. -We regard the safety of the children in our sport as a top priority. The Padel Federation’s National Children’s Officer is always available to clubs to provide training and advice. -We operate a variety of development initiatives, which are focused on the club and recreational sector in padel. For the most part these programmes are delivered through Regional Development Officers. These initiatives range from Club open days to padel clinics and promotional events. -Access to online members’ area and regular newsletter service.